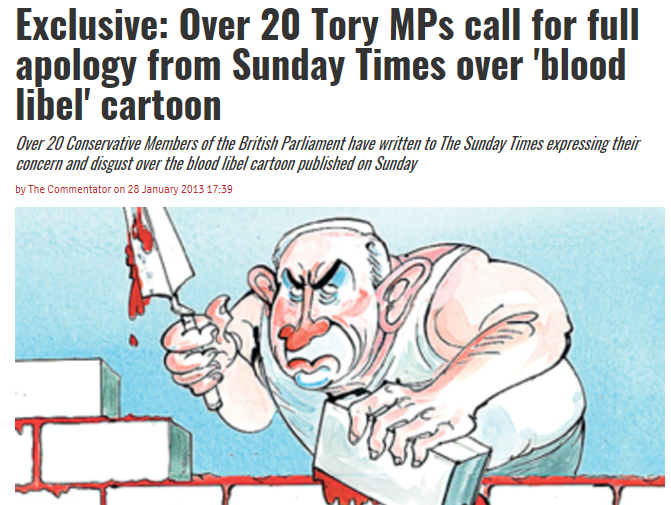 Prime Minister Theresa May committed a blood libel against Russians in the House of Commons last week. This was the allegation that the Russian state and all Russians are murderers. 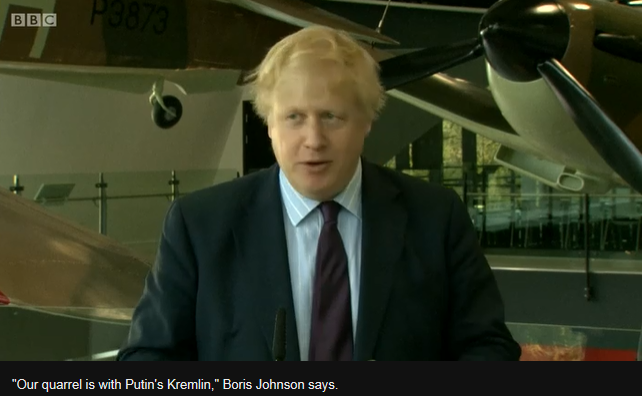 May has subsequently asked the Foreign Secretary and the Foreign and Commonwealth Office (FCO) to correct the record by charging that only one Russian, President Vladimir Putin, is a murderer. The Canadian Government was also requested by the British to urgently correct the record May has been making in refusing to allow the international rules of the Chemical Weapons Convention to decide what happened in the poison attack in Salisbury on March 4. According to the new Canadian statement, coordinated with the British, the international convention can be suspended by Prime Minister May in order to make her blood libel stick. If this is reminding you of Adolph Hitler’s blood libel against the Jews, followed by Austrian support after the Anschluss (union) with Germany of 1938, it should. A blood libel is an allegation of murder against a race of people. Its history is ancient; it’s most familiar today as the charge of ritual murder against Jews. Hitler and the Nazis followed many others over a thousand years of European history. That history also includes organizations associated with the Russian Orthodox Church and several Romanov tsars. Read a brief summary. The last tsar, Nicholas II, used to read the blood libel aloud to his family during Lent of 1918, and at the family’s Easter service that year, when the Romanovs were under arrest in Tobolsk; for the record, read pages 114-117 of this British history. Left: Nicholas with his wife and two of his daughters at Tobolsk. 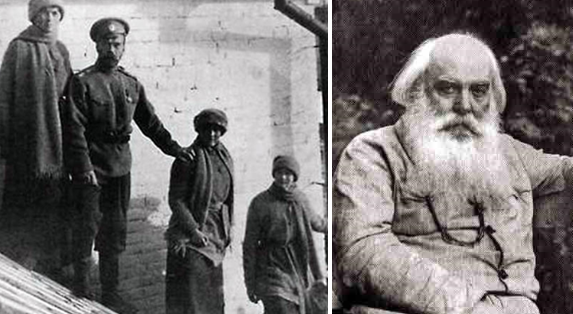 Right: Sergei Nilus, author of a series of blood libel books which were favourites of the tsar. Possession of Nilus’s books was a criminal offence in the Soviet Union. In the form of allegations of ritual cannibalism, the blood libel has also been a recurring allegation in inter-tribal, genocidal and also colonial wars in Africa, Australasia, North and South America. In the UK, publishing or broadcasting a blood libel is an offence against the law, a hate crime. This is what the Metropolitan Police advise is British law, and how to enforce it in cases of verbal abuse or incitement to violence. Writing hate on walls is a crime in the UK. 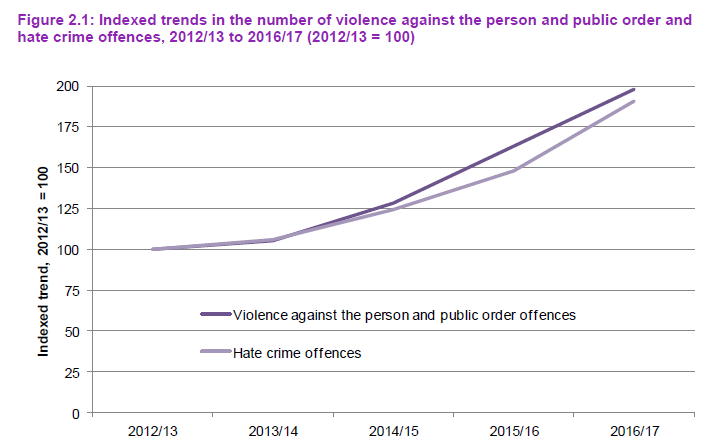 According to the Home Office, “offences with a xenophobic element (such as graffiti targeting certain nationalities) can be recorded as race hate crimes by the police.” The effect of media reporting and broadcasting has been to accelerate the rate of growth in the police statistics of hate crime. The Home Office reported last October that in the year between April 1, 2016, and March 31, 2017, the number of hate crime offences recorded by the British police was 80,393. That was up 29% over the previous year, and nearly double the number reported for 2012-2013. The Latin term ‘sic’ has been added. It’s short for the full Latin phrase, ‘sic erat scriptum’ (‘thus it was written’). It is a term of irony, used to qualify what was said or written when the correct spelling and grammar or the known truth are different. This was the way in which May intended to refer to all Russians. She did not refer to individual perpetrators of the crime she alleged to have been committed in Salisbury. She couldn’t. She and her government have so far presented evidence of victims, but no evidence of a weapon or a crime. “So Mr Speaker, there is no alternative [sic] conclusion other than that the Russian State [sic] was culpable for the attempted murder of Mr Skripal and his daughter – and for threatening the lives of other British citizens in Salisbury, including Detective Sergeant Nick Bailey.” The first ‘sic’ indicates that May was lying about the scope for alternative conclusions; there are many alternative conclusions, and these include press-reported leaks from the Foreign Office and the Porton Down Defence Science and Technology Laboratory . The second ‘sic’ identifies the term which, in Oxford Dictionary English, means a nation or territory or political community under a single government. May’s allegation was a blood libel against the nation and community of Russians, all of them. That last phrase by the FCO means one thing to the British; another thing for everybody else. This was revealed across the water in Ottawa, the Canadian capital, and at The Hague, the Dutch headquarters of the Organization for the Prohibition of Chemical Weapons (OPCW). 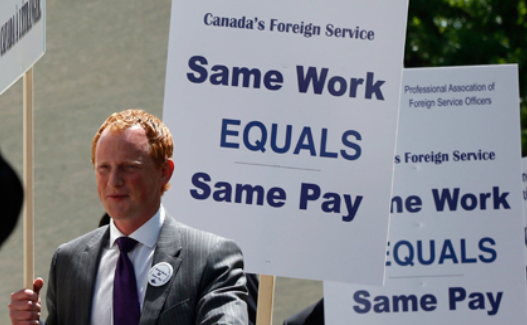 This Canadian statement was released on March 15; click to read here. The Canadian representative to OPCW, Timothy Edwards, is a junior diplomat from Ottawa who was standing in for his country at the OPCW because Sabine Nolke, the Canadian government’s official representative, doubles as Canada’s ambassador to The Netherlands. Nolke was elsewhere when Edwards was employed to break the Chemical Weapons Convention. Edwards didn’t say this aloud in front of other OPCW representatives. Instead, his March 15 “supplementary statement” was slipped into the OPCW’s mailbox for publication by a secretary on the organization’s website. Edwards did give a speech two days before, on March 13. That speech in the OPCW record reveals Canada was carefully avoiding the British jump to conclusion that Russia was to blame. How could Canada guess the British prime minister was about to declare the investigation proceeding at an end – and also that the British were unilaterally halting their commitment to the Chemical Weapons Convention? By getting Canada to introduce the reservation to Article IX without open discussion by OPCW members, the British arranged an alibi for violating the convention themselves.